Portland, OR â The Collins Companies has just announced that it has commissioned the first 100% FSC-certified bicycle in the nation. The bike, manufactured by Renovo Hardwood Bicycles, is an âR4 Pursuitâ model that features a stiff, powerful and lightweight frame. All of Renovoâs bikes are custom-made â adjusting the stiffness and ride quality to the customerâs individual riding style and weight. The bike is making its worldwide debut at the Greenbuild International Conference in Chicago, on November 17-19, 2010. Collins had this bike commissioned for one of their employees, to demonstrate their continued commitment to this mission. âAlthough wood bicycles are still in their infancy, we are constantly exploring new ways to have CollinsWood incorporated into everyday products and we want our customers to explore new uses,â said Cameron Waner, marketing coordinator for The Collins Companies. The Collins Companies produces high quality wood products including, softwoods, hardwoods, particleboard and engineered wood siding and trim, all available FSC certified. It is based in Portland, Oregon and has been family-owned since 1855. 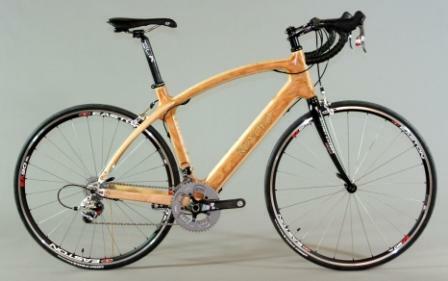 Renovo Hardwood Bicycles designs and custom manufactures wooden bicycles from its headquarters in Portland, Oregon.